Most of us can agree that some skills are perishable, meaning that if you do not practice these skills they will degrade over time. Marksmanship skills undoubtedly fall into this category. So, we have to practice in order to stay sharp. The problem is, ammunition and gun ranges are expensive and sometimes far away. Additionally, with all that we do in our lives, it is not always easy to find the time to make it to the range. What can you do? If you have not heard of dry firing, here you go: Dry firing is the process of firing your firearm, with no ammunition in the gun (or present in the room). It’s that simple and FREE. If you have heard of dry firing, you may have heard that it will damage your firearm. This is true for most rim-fired pistols (mainly your .22’s). A center-fired pistol will not be damaged from repeated dry firing. In fact, some manufacturers have added this information to the manuals to put owners’ minds at ease. If you are still concerned, grab some dummy rounds, snap caps, etc., and dry fire the heck out of your firearm. Remember, a quality firearm is built from hardened steel, designed to contain an explosion and can function under extreme pressures. The firearm can tolerate you squeezing the trigger or you racking a slide. The benefits of dry firing cannot be overlooked. 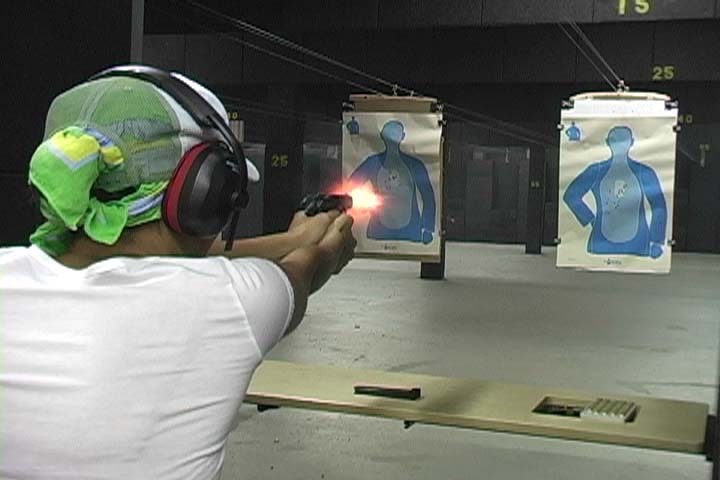 You can practice your trigger control by slowly squeezing the trigger while focusing on your sights. Do this hundreds of times until your sights do not come out of alignment. You can also practice drawing your firearm, presenting it, moving and squeezing the trigger. These simple drills are fun and cost absolutely zero dollars! Because range time and ammunition are so expensive and time is precious, when we get to go shooting, we have to make it count. We have to get the most out of our live fire practice. I understand there are many reasons people own firearms. For this discussion, we are focusing on ownership for personal defense reasons. If you are going to the range to practice personal defense, you have to train using personal defense tactics at least 75% of the time. Your practicing at the range will be ineffective if you only use marksmanship tactics. It is great to be able to keyhole shot after shot while shooting slow fire, while taking your time, under no mental or physical stress, all from 50 yards away. It shows that you can apply the fundamentals and gives you confidence in your skills and handgun. However, if this is how you practice most of the time, you are setting yourself up for failure. Similarly, if your personal defense pistol shooting practice comprises firing a box of ammo through your weapon as quickly as you can, you are doing yourself no favors. I know that it is enticing to run the target further out than all the other targets on the range, to show everyone how good of a shooter you are, or to empty a magazine of ammo before the first piece of brass hits the floor. The truth is that these skills really are almost meaningless in most deadly force encounters. The ability to quickly assess your threat and what is behind it, draw your firearm, place multiple shots on target, reassess the threat, all while controlling adrenaline, tunnel vision, and yeah, probably moving a bit too, are essential personal defense skills that save the day. You have no doubt heard the old adage, “practice makes perfect” at some time in your lifetime. Did you buy into it? Did it make you practice more and work harder on improving your skill-set? Well, if you got better at whatever you were practicing for, terrific! If you did not get better, don’t fret. It may not be your fault. I am here to tell you that practice does not always make perfect! Confused? Read on and it will all make perfect sense. Shooting one handed from retention is a technique you should practice. The problem with muscle memory is that our brain does not know if it is creating good muscle memory or poor muscle memory. Let’s say, for instance, I want to learn how to play the piano. If I practice and practice, but while I am practicing, I hit the wrong key at a certain point in the song, guess what, I will hit the wrong key every time during that part of the song. If we want to properly learn the song, we need to properly practice the song. So in this way, we want to practice for optimum results, and for how we will actually apply our learned skills. For this reason, it is actually more important to focus on how you practice (purposefully), and not so much that you just practice. Practice moving to, and shooting around objects. Instead of simply saying, “practice makes perfect” let’s think of it as “perfect practice makes perfect.” Making a little more sense now right? The way we practice is the way we will perform under stress. So, for personal defense, lets practice in a way that will more closely replicate deadly force encounters. This requires you to change what you currently are doing at the range. Practice, not merely just shooting a target, but visualizing the target as a threat. Or, practice for possibly sighting a non-threat and not shooting at this non-threat. Practice moving offline, a step or two to the side, backward or forwards while presenting the weapon and firing multiple controlled shots. Practice using point shooting and keeping your main focus on the threat, and not relying on your firearm sights. Practice drawing from the holster (practice drawing while dry-firing first, before going live. Ensure your draw is technically sound and that you are not moving your finger to the trigger until the muzzle is clear from your body.). Practice staying aimed at the threat in order to reassess and fire follow-up shots if necessary. Practice multiple targets, some being threats and some being friendly. Practice one-handed and off-handed shooting (non-dominant hand). Practice shooting from different positions, i.e., sitting, kneeling, from the back, while lying on your side, etc. Magazine changes while on the move take practice and proper technique. These are just a few ideas that you can incorporate into your next practice session. This practice will translate into more “real world” skills that you can reference if the time ever comes. I know, I know, most commercial ranges will not let you do half of the things I mentioned. Try to find a good gun club that allows you to shoot in some of these ways. 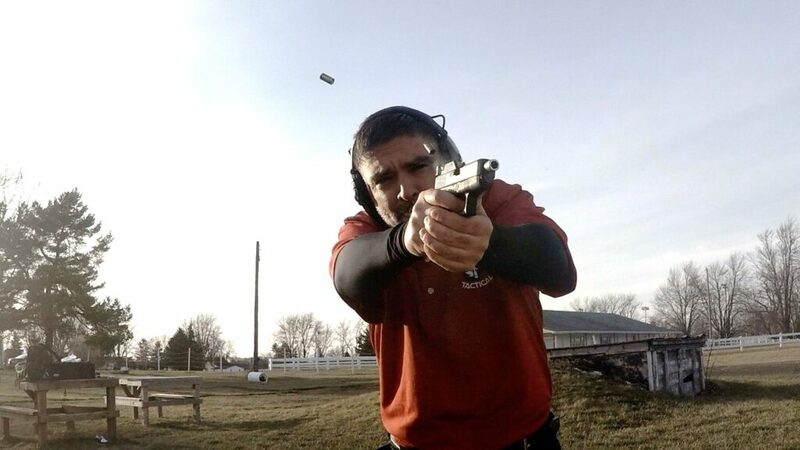 If you cannot find a gun club and your commercial range prohibits most of these techniques, don’t fear, these can all be practiced during dry fire. While it is always great to get out and send some real lead downrange, don’t miss out on “trigger time” in your own home for free. Just make sure your gun is clear, and that all ammunition is removed and locked away. Additionally, don’t overlook taking a personal defense class. You can gain some great tips, techniques, and drills that you can take back with you and apply to your practice routine. Just be sure to vet the instructors and research their experience. Remember that in the end, how you practice will be how you perform. When you get into that stressful life or death situation and decide deadly force is the only option, don’t have your brain default to a 50-yard slow fire shot with perfect sight alignment and perfect sight picture. It is not going to happen. Have your default be a skillful deployment of your firearm, while moving offline, allowing you to fire as many shots as necessary to stop that threat, without placing anyone else in harm’s way. 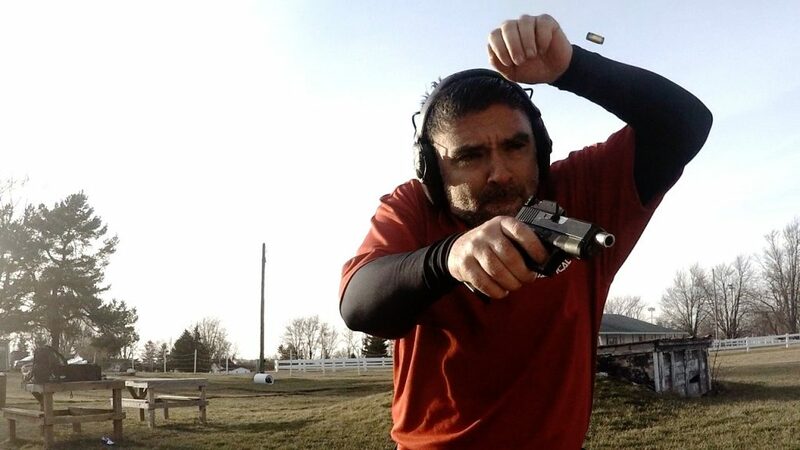 8 Responses to Personal Defense Pistol Skills: Does Practice Really Make Perfect? Great insight and great tips, Thank you! Good article, especially the part about learning to point shoot and move evasively fast. If you are suddenly attacked in an ambush intended to kill you, your sights are likely to do you little good. In police shootings, because of the surprise factor they commonly have to shoot from the hip by point shooting only and are lucky, in all the excitement and jumping around, to hit a bad guy even 1 time out of 6 shots, and often less http://www.theppsc.org/Staff_Views/Aveni/OIS.pdf The article should have included some emphasis on the importance of getting under hard cover fast, like a brick wall or something, since keeping yourself alive is more important than whether you nuke the other guy. Thanks for the feedback. Moving to cover or moving period to create different angles between you and the attacker is a huge part of staying alive in a fight with or without a gun. I will definitely include this in a future article!! Thanks again! I would add that you consider, at least, going to watch an IDPA match. You will get to see most of the things Matthew recommends put to practice. When I first went and saw what they were doing I said “I’ve got to have some of this”. 5 Defensive Stages/Scenarios that you had to “shoot your way out of”. Shoot Strong-Hand, Weak-Hand, only etc. don’t really “compete” but are shooting in matches to get better at Self Defense. Young, old, male, female, all walks of life. And it “Will” make you better at it. And it will make you safer and better at gun handling. In fact, I would say it is the best/cheapest Self Defense training you can get. And meet good people like you who are like minded. Just start talking to people, most will be very welcoming and willing to help you. I agree with all Bill said! 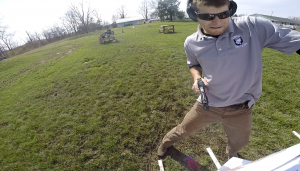 IDPA is the way to go to get at least some practical handgun experience. It will show you what you’re weak at and need to practice more, like weak/non-dominate hand, prone shooting, and moving and shooting without tripping and falling! We have a tendency to practice what we are good at, not our weaknesses. All that talk of moving off line and shooting while moving is fine for those that can. I have a bad back and have to walk with a cane and then only slowly and painfully. But I do carry daily and dry fire and get to the range a couple of times a year. My range does not allow moving or drawing from holster but I do practice one handed ( walk with a cane so will only have one hand free ) and if no one else is at the range will sneak in a few draws from holster. I might be old and half crippled but still do what I can.